Of course, stray dogs live a tough life regardless of what streets they roam in their corners of the world. However, it seems as though the dogs that call the lanes of Chiang Mai home face a particularly uphill climb. 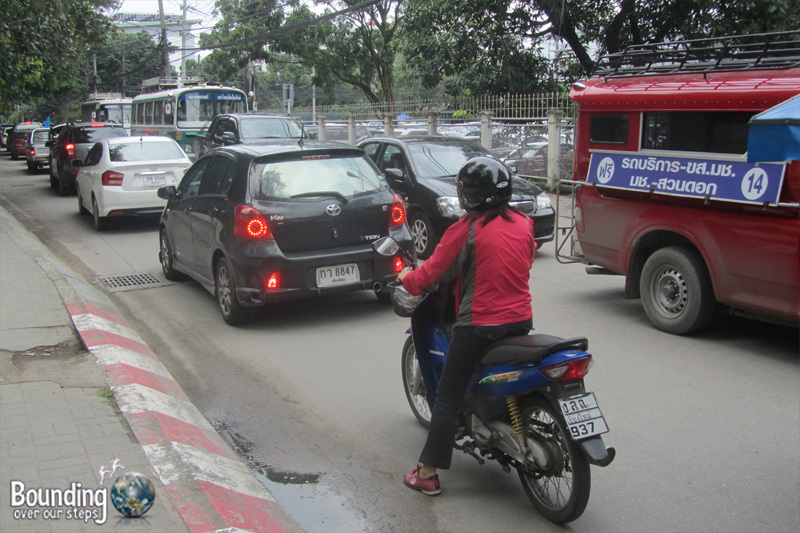 These soi dogs, as they’re commonly known, must overcome challenges around every turn if they are to survive. In Chiang Mai, much like all other places in Thailand, the number of stray dogs is extremely high. Overcrowding in the streets often leads to aggressive, territorial behavior. Alpha dogs, along with their packs, will thrive, whereas solitary or more submissive dogs frequently get attacked. With such a high population, rabies outbreaks can be a concern, both for humans and canines alike. Although the disease can be prevented with a vaccine, few people are looking out for the well-being of stray dogs. Once rabies symptoms appear, death is imminent and torturous. Without any population control, neighborhoods are often overrun with dogs. If their existence poses too high of a nuisance to the people sharing their living space, poison may very well find its way as an added ingredient to their evening meal. Moreover, if pigeons are poisoned to reduce their numbers, dogs that eat those dying birds can also get sick and die. Although Chiang Mai is considered a small city compared to Bangkok, the metropolitan area is home to over 1 million residents. Cars, song taews and motorbikes flood the streets, and sadly, dogs are frequently injured, maimed and killed by being hit on the roads. Certainly, the nastiest fate a dog in Chiang Mai might end up with, is getting trapped in the dog meat trade. Collect trucks roam the streets, picking up stray dogs, who are then crammed into cages and transported overland into the larger meat markets of Laos and Vietnam. If they survive the truck ride, they are force-fed through a tube into their stomachs to increase their weight. Many times, a dog’s stomach will explode as a result of this, but since death is the intention anyway, they’re just sold to a buyer earlier. Warning: The video below is extremely graphic and may not be appropriate for all viewers. Viewer discretion is strongly advised. Despite, or perhaps because of, all these challenges facing stray dogs in Chiang Mai, there are people helping. Care for Dogs is a non-profit foundation dedicated to improving the lives of street dogs in the city, by providing medical treatment, fighting against the dog meat trade and running a sterilization program to help control the canine population, as well as running a rescue center. Lanna Dog Welfare works directly in the community taking care of stray dogs in need, educating people on how to solve problems with dogs in a non-violent way, and advocating for animal welfare to local governments. Save Elephant Foundation also runs a Dog Rescue Project, which is currently home to over 400 dogs, provides veterinary care in its small animal clinic for the local community, and rescues animals from the meat trade. All of these foundations accept volunteers, will help arrange adoptions and gladly accept donations, so everyone can pitch in and make the lives of these pups so much better! Thanks for sharing the story of these Soi dogs. This is an especially poignant post today with the death of James Bond. Deep respect to the rescue groups for their dedication and commitment to improving/saving so many of these lives. For those of you who don’t know, James Bond was a soi dog who was rescued from the streets by Save Elephant Foundation and lived at Elephant Nature Park for the last 11 years. Unlike most soi dogs, James Bond died of old age and was surrounded by those who loved him. The street dog situation was really break both mine and Francas hearts when we were in Thailand, and all we ever wanted to do was to help them. We thought about feeding them when we could but at times it felt as though we were just making things worse in the long run. Thankfully there are so many good people in Thailand trying to make a difference, and as our month with the dogs at ENP made us realise, they are starting to make a difference, maybe slowly starting to educate people a little. Spending time at ENP can definitely change people’s relationship with animals. It helped us in the decision to go vegan, for example. We too are so happy about all the organizations that are helping them. Maybe on your next trip to Thailand you will see a difference from your last visit. This is really nothing more than alarmism. As someone who has lived in Chiang Mai for 5+ years, the situation is really quite different than what you paint here. For one thing “stray dogs” has a completely different meaning in places like the US and Canada. Here, as you should know, dogs are cared for by the community, and many so-called “stray dogs” live in or near temple compounds. Just because a dog isn’t on a leash and doesn’t have an “owner” does not mean that the dog is not cared for. Sure, dogs are territorial and pack animals, that is their nature. The idea that all dogs should be living inside houses with humans is a quite modern invention. How many dogs know how to cross streets and are fully integrated into their local community? Why not talk about that behavior and reality? Yes, there are some dogs who suffer with a skin disease, and rabies does exist, but the situations you display here are unusual and rare. Thank you for your comments. This post is not intended to be “alarmist”. 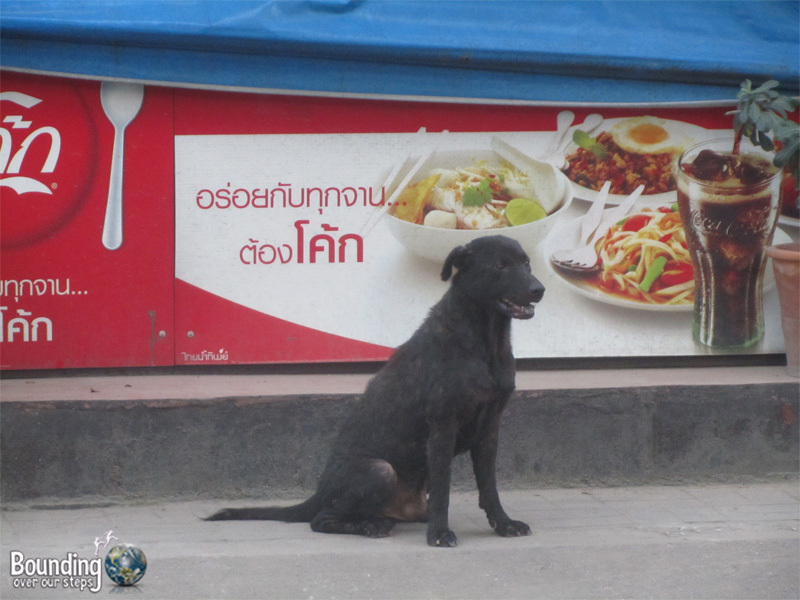 I wanted to write about the different types of challenges stray dogs encounter in Chiang Mai. Of course, there are some street dogs that are well cared for in their communities, and I’m certainly not advocating that they should be scooped up and “rescued” to be in a shelter for the rest of their lives. However, that doesn’t negate the fact that life on the streets is still filled with dangerous possibilities. Back home, in Canada, I saw a couple of dogs on the street look both ways before crossing. Most animals aren’t dumb, and most vehicle accidents are just that – accidents. Also, I wouldn’t necessarily agree with your position that the community at large is overly accepting of dogs. Tolerant, yes, to a point, but I don’t think it goes so far as accepting. Thus, when the local population of stray dogs gets too high, or when a new litter arrives, many canines are dropped off at temples. Unfortunately, when those temples are overrun with dogs, the monks are simply unable to care properly for them. I also contend that some monks are actively breeding pure-bred dogs for sale, as I’ve seen bull terriers and Siberian huskies. I have volunteered with the Dog Rescue Project I mentioned above and can confirm that the cases of dogs lost to the dog meat trade, attacks by other dogs and getting hit by cars are not unusual and rare. Some dogs are sold for as little as 100 Baht, or for a laundry bucket, to dog meat traders. Again, I’m not saying that all dogs in Chiang Mai are guaranteed to face all these challenges, but that they indeed exist. Have you seen John’s film, Shadow Trade? He is very active in helping to stop the dog meat trade. Thanks for the links! 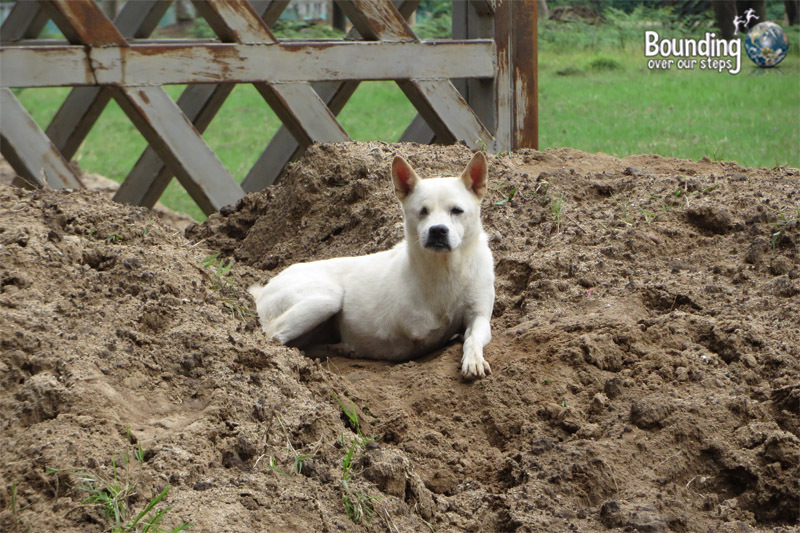 Soi Dog is a foundation located in Phuket, and we have friends that volunteered with them. 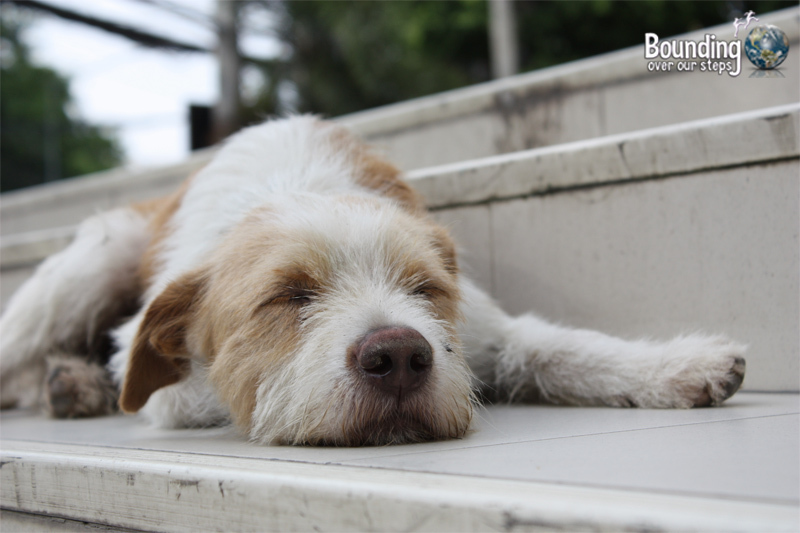 I was just focusing on the lives of dogs in Chiang Mai for this post, which is why I didn’t include them. However, for dog-lovers heading to the south Thailand, definitely check them out! I’ll have to watch John’s film. I hope it’s not as graphic as the one that has given me nightmares since. A sad situation but so good to hear there are organizations that will take care of them. If there is one thing that breaks my heart, it is seeing the stray dogs — and cats — in Chiang Mai. There are some places in the world which run aggressive spay/neuter trap and release programs to cut down on the overpopulation of these animals. I wish CM would do the same. While I do see many street dogs who look healthy and cared for, I also see plenty with missing limbs, gunky eyes, severely underweight, etc. And, as one of your commenters mentioned temples — I was at a temple and found a dying puppy there — one that was clearly bred as I saw mom and dad and they were pure breds. The puppy was horrible looking and I took her to the monk and asked if she was going to see a vet. He told me they would take her in a month, which of course, would be past her expiration based on her health conditions and my basic knowledge of animal welfare. I asked if I could take her to the vet and he shrugged his shoulders and said “up to you.” So, I did. Not only was she severely underweight, but she also had pneumonia, a flea infestation and more. So, not all temple dogs are well cared for. And I imagine if that particular temple couldn’t be bothered to care for her, the temple certainly couldn’t be bothered to care for other dogs there, too. Hi Diane, we have travelled throughout Asia for over 35 years and sadly I have seen similar things in many temples. I don’t understand how the monks (supposedly people of peace and wellbeing) can just stand by and watch these poor animals suffer like they do. How wonderful. It is really just common sense. hi, my husband and I have been in Thailand for the last 7 weeks. We were in Siri Beach for 1 week where we saw a few stray dogs. Then we went to Cape Panwa for a week, where we saw no stray dogs. We then went to Patong and the amount of strays was overwhelming. They were everywhere. Thank heavens we did not see any get ran over but many came very close. We are now in Chiangmai for the final week of our travels and I have been really surprised by the fact we have only seen 2 dogs wandering near our hotel and I think they were actually owned. I had a bag of meat left over from some meals and I carried it around all night and all the next day looking for some dogs to give it to. We could not find a single dog so we ended up leaving it near a wall in the hope a dog would find it. I thought that maybe the local authorities had maybe had a cull (which I would be horrified if true) but even more horrific I am now thinking after reading some of these posts that maybe they have all been gathered up for the dog meat trade. Hope I am wrong but honestly we could not find a single stray dog. It sounds like you and your husband have enjoyed a variety of places in Thailand. Many of the dogs in Chiang Mai seem to be outside the city center. As far as we know there hasn’t been a cull for the dog meat trade. But, we are aware that the city government dogs poison the pigeons and rats around the moat every few months. In our experience the dog meat trade seems to be individuals who sell their own dog or strays that they find.